September at the Farm is always a mixed bag. Generally, (barring hurricanes, nor’easters, drought and various blights) our produce is at its peak in September. Truly spectacular. The jewel tones of the peppers, eggplant, beets, and carrots seem to glow. The fact that we actually have time to stop and see them might play a part as well. There is usually a short window when we have just about everything we grow in the Farm Stand. Might just be a day, or even an hour (the last bin of watermelons sells down as the first bin of winter squash makes its debut.) This year we’ve had a bit of a gap between the melons and the pumpkins, but we know that the hues of our produce displays will fade from the hot pink and purple of the radishes to the bright orange and dark green of the fall harvest. I sometimes get the sense that I’m a kid in a candy store in September. I’m not quite done with corn (and fortunately there’s no sign of it slowing down any time soon,) tomatoes and basil are still a part of our daily menus and the crunch of radishes makes its way into every salad. At the same time, I’m salivating over my first Delicata of the year, and creating a recipe for a stuffing for that, while dreaming about the Long Island Cheese Pumpkin Soup that Leah makes. Hard to fit all of this in, but I sure do try. Though I don’t can as much as I use to, I do try to stock up and freeze some of my summer favorites. Last week, it was peppers. The small, lunch box or picnic peppers are sweet and substantial for their size. I don’t seed them, as I don’t find the extra crunch unpleasant, and the seeds are fairly small. I give them a wash, pat dry with towels, toss with olive oil, salt and pepper, and roast at 425 for about 45 minutes, give or take. I’m looking for straight up pepper submission. 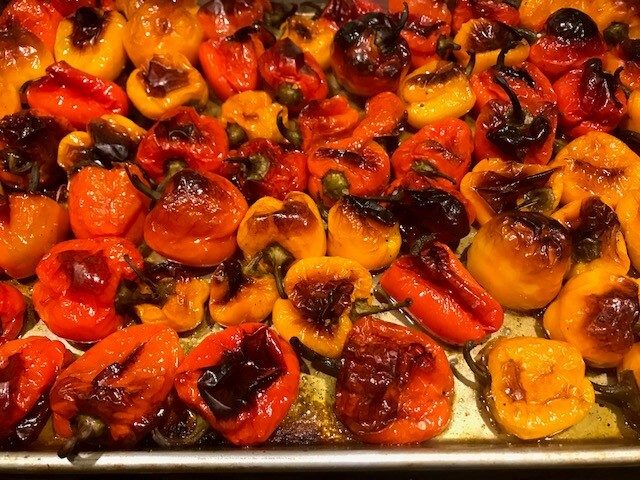 I want those perfect peppers to be all melty with browned bubbles, sputtering and sizzling as I pull the pan from the oven. After they’ve cooled, I pop the stem end off, and layer them in a rectangular dish with a cover. I pour olive oil over the whole mess, and chill in the fridge. If (and that’s a big if) they last a few days, I’ll scoop them into heavy duty zip loc bags, squeeze out the air and lay them flat to freeze. The bonus is the delicious and savory olive oil remnants that are in the dish after filling the bags. All winter long, they flavor soups, stews, are a quick and easy addition to Sausages with peppers and onions. They also make a killer last minute jam to dress up a great soft cheese. Simply sauté a few with a diced shallot, an anchovy filet or two, a tiny splash of wine, a squidge of tomato paste and finish with a bit of butter. Yep. Butter on Cheese. There. I’ve said it. There will likely be one more Pick Your Own (PYO) Tomato event in the fields. All varieties should be available, from the Artisanal grapes to Heirlooms to Cherries (yes, even Sun Golds) and the big reds. I will make a sauce, I will do a few jars of cherries, barely cooked and swimming in Olive Oil, I will roast a few. And then, in the middle of February, after a day on my new snow shoes (yes, you can thank me for the lack of snow last year, when I bought new snow shoes) I’ll come home, open a jar and breathe in the best part of summer.